Back in the day, when I was a recent college grad who didn't know any better, I had this ridiculous instant ramen habit. Like the alcoholic who raids the medicine cabinet for cough syrup (or, in one memorable episode of Family Ties, the pantry for vanilla), I got my noodle fix whenever and however I could, no matter how cheap and dirty. It turns out I could have been making delicious duck noodles with a bit more time and about the same amount of effort. How could something this tasty be this easy to make? It defies all logic. Now before we continue, I should point out that I cheated to make this soup. In fact, first I cheated to make some duck red curry, and that led to this cheater's broth. I bought a roasted duck from a Chinese deli, had the guy who sold it to me hack it into pieces, then heated up the meat (sans bones) in my curry. Every single scrap that didn't go into the curry went into a pot to make the broth. Of course, making the duck curry is optional; you can always eat the duck meat with the soup, or in any other dish of your choosing. For some reason, the scum that usually forms when I'm making chicken or pork broth did not appear, making this broth truly effort-free. 1. Place the bones, head, and all into a large pot and add the green onions and ginger. Add water until bones are just covered. 2. Bring to a boil, then turn heat to medium-low, cover with a lid, and simmer for about 45 minutes to an hour. Go read a book. Do laundry. Solve a crossword. When you are ready to eat your noodles, just boil a pot of water, add a handful of green veggies, about a minute later (depending on the veggie), add a serving of dried rice vermicelli. Cook for another minute. Drain. 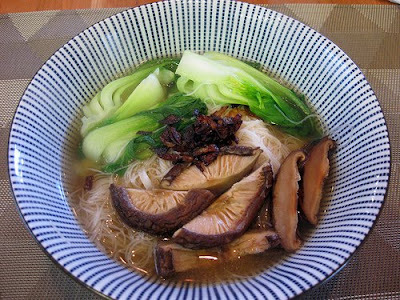 Place in bowl and top with hot broth. If you used up all your duck and would like some protein to go with your soup, some smoked tofu would be tasty here, or rehydrated shiitakes (just soak dried shiitake mushrooms in very warm water for about 15 minutes). 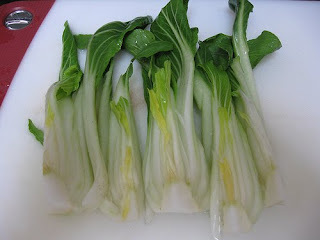 I used baby bok choy as my veggie, and can offer the following tip. To prepare baby bok choy for soup (or stir fries) just pick off and discard any damaged leaves, trim the bottom slightly, then slice in half or in quarters, depending on how big your bok choy is. Now you can rinse the insides of the veggies. A lot of dirt can collect near the stem, so pay particular attention to that area when washing. Not in the mood for noodle soup? That question doesn't really make sense to me, but okay, here's another option. Once the duck broth is made, throw in about 1½ cups of short grain rice and simmer, covered, for about 45 minutes, or until rice is very soft. You may need to add more water. The consistency should be like watery oatmeal. Serve with sliced green onions and (optional) a sliced thousand year old egg. i think i'll be eating some tasty noodles for dinner tonight. So yummy! Thanks for sharing this one.